Even Fidel Castro knows communism doesn't work. Many years ago, the Chinese government realized that communism had failed economically. They had to grow their economy because the peasants were revolting, so they declared that it was OK for entrepreneurs to found businesses and make themselves rich. The Chinese didn't offer tax credits or incentives. They didn't clean up their famously corrupt judiciary or try to root out crooked party members. They merely got out of the way by declaring that generating personal wealth, which high-level government officials knew was utterly impossible without hiring a lot of employees, was no longer a capital offense. The resulting economic boom has been called the Chinese Miracle. The Chinese recently overtook the Japanese to become the #2 economy in the world. The increased taxes paid by the newly wealthy Chinese middle class made it possible for the government to afford the Beijing Olympics, a blue-water navy, research into extracting deep water ocean resources, a high-speed rail and highway network, and a space program among many other useful things. Not bad for merely getting out of the way! It wasn't quite that simple, however. In a sense, the Chinese experiment with unleashed capitalism shouldn't be called a job creation program because, technically speaking, every Chinese adult had a job at the time and all graduates were guaranteed jobs. All the farmers worked for state-owned farms, all city dwellers had jobs working for one of the State-Owned Enterprises (SOEs). As with government-run enterprises everywhere, the SOEs were famously overmanned and ridiculously inefficient, but the unemployment rate was 0%. It wouldn't have done much good just to tell entrepreneurs that they could go ahead and get rich because nobody can get rich alone. Getting rich absolutely requires hiring employees to help you get rich. Even media folk such as Oprah Winfrey, Madonna, and Rush Limbaugh who make their personal selves into products don't do it alone - they hire hordes of staffers to help them make themselves rich. As long as Oprah or Rush can figure out how an additional employee can bring in more revenue than he or she costs, they'll keep hiring. But what if nobody will work for you because everybody already has a job? Suppose you're a middle manager at one of the Chinese SOEs. You know you aren't going to advance, but you'll never be fired and you don't have to work all that hard if at all. You have company housing, company medical care such as it is but you don't know any better, and you'll have a pension when you retire at the statutory age. Along comes your idiot brother-in-law who's got some crazy idea about getting rich by putting together Happy Meal toys, selling cheap alarm clocks to Wal-Mart, or some such goofball notion. Imagine your reaction when he shows you one of his sample Happy Meal toys. "You're gonna get rich selling those? Not even crazy round-eyes will buy those! Go away!" You sit there in your safe, secure, SOE job, counting the minutes, hours, and days until retirement just like the vast majority of government employees everywhere. In order to get the Chinese miracle to take off, the government had to encourage vast numbers of employees to take advantage of the entrepreneurial opportunities they were offering. The key to the miracle wasn't just getting out of the way as essential as that was. They also had to squeeze the SOEs to create surplus workers hungry enough to either start new businesses or to go to work for new businesses. So they started squeezing. One of their first moves was to start charging SOEs interest on the money they borrowed from the government to cover their deficits each year - previously, this had just been free money from heaven. They made it clear that they'd wind up any SOE whose debt level kept increasing with no plausible way of turning around. The only way to convince the multitudes that they were serious was to drive some SOEs to the wall, which they did, spectacularly and messily. The threat of being wound up and turfed out into the mean streets concentrates the mind wonderfully. All of a sudden, upper level SOE management, who mere months before had sworn that they needed every single one of their overworked employees to function at all, discovered that they didn't. Getting by with fewer workers meant squeezing more work out of the survivors, of course. This isn't hard to do when you suddenly discover that the government has given you the power to fire employees and that they'll fire you if you don't cut costs deeply enough. All of a sudden, as if by magic, there was a vast pool of hungry entrepreneurs and potential employees facing starvation. Did they starve? Nope, they went to work and created the Chinese Miracle. The Cubans, being a bit less inscrutable than the Chinese, are a bit more forthcoming about their economic plans. Castroism, for all its political success in keeping power concentrated in Castro's hands, is as economically bankrupt as Chinese communism if not worse. There's enough contact between Cuban residents and their offshore kin that the Cubans know that their country has failed economically. Although the secret police are still adept at rounding up dissidents, protests are becoming more common and less covert. Like the Chinese after Tiananmen Square, the government has to do something to keep the peasants from revolting. Cuba has announced radical plans to lay off huge numbers of state employees, to help revive the communist country's struggling economy. Those laid off will be encouraged to become self-employed or join new private enterprises, on which some of the current restrictions will be eased. That's the Chinese recipe for reviving struggling economies in a nutshell -create massive unemployment over a period of time by squeezing government-owned businesses whle offering the newly unemployed opportunities to make money by starting as many businesses as possible. The BBC pointed out that of the estimated 5.1 million workers in Cuba, 85%, or 4.3 million, are government employees. Firing one million workers will reduce government employment by close to 25%. That's about what the Chinese did when they squeezed their SOEs; some of the survivors became profitable enough to sell stock via IPOs. By comparison, the American federal government, excluding the Post Office and Amtrak, employs about 2 million. Excluding education and hospitals, state and local governments employ 8.3 million. Adding up all the government-employed teachers, health care, and postal workers would take too much Googling, so let's simply assess total government employment at 10.3 million workers. Cutting government employment by 25% would put 2.5 million hungry ex-bureaucrats on the street. "We have to end forever the notion that Cuba is the only country in the world where you can live without working," he [Raul Castro] said. The Cuban and Chinese plan for economic growth starts by creating massive employment and getting out of the way at the same time. The goal is to lay off government employees about as fast as they're able to start new businesses while making unemployment unpleasant enough for them to want to do that. The Chinese did it and it worked like a dream; the Cubans are taking baby steps along the same road. We hope that they arrive at the same destination. It's not enough to say you want businesses to create jobs, you have to offer incentives. Whereas the Chinese and Cuban governments said it was OK to get rich, the Obama administration is threatening to tax away all the profits while vilifying businessmen who create enough jobs to earn serious amounts of money for themselves. It's not enough for businessmen to want to create jobs, willing employees have to be available at a price that lets employers earn a profit from their labor. Whereas China and Cuba are squeezing their SOEs and throwing employees out with no social safety net, the Obama administration is growing unproductive government jobs, extending unemployment payments, and raising minimum wages and other employment costs to make it harder to make money by creating jobs. There's no incentive quite as effective as real unemployment. Cuba plans to deliberately create a 10% unemployment rate by March of 2011 and go on from there. Given the obvious lack of productivity in government organizations all around the world, it's likely that most of these million workers are in fact not doing anything much, but now they won't be paid for doing nothing much. In trying to survive, they'll have to offer goods and services which their fellow Cubans actually want to buy. When the Chinese SOEs were squeezed, they naturally got rid of their least useful employees first. The Chinese Miracle was carried out by government rejects. It remains to be seen whether the Cuban government will be able to achieve similarly high standards among the employees it lays off. Assuming that they pull it off, we'll soon be seeing Burger King toys stamped "Made in Cuba." When was the last time anyone saw a freebie toy stamped "Made in USA"? Unemployment Insurance: A Permanent Entitlement? Why is it that communist regimes lead to capitalist societies and capitalist societies lead to communist regimes? Why do civilizations swing back and forth from one to the other? Isn't there a point where we can all agree This Idea Works and leave it the heck alone? The problem, I guess, is that the electorate is dynamic. We may know what works, but we can't stay alive long enough for it to matter for more than a generation or so. The Chinese have managed to create a number of reasonably stable, long-term governments. Although there is dispute about the earlier dynasties, dates since the Sung are reasonably well documented. The Sung ruled for nearly 300 years. The Yuan dynasty was run by the descendants of Kublai Khan, grandson of Genghis. His dynasty didn't last long because his descendants weren't Chinese and had trouble maintaining the tradition of unbreakable laws which Genghis had started. After driving out the Mongols, the Ming ruled for nearly 300 years and the Manchu for nearly 300 years. The Chinese have managed to set up at least 3 regimes which lasted 1.5 times as long as America has been an independent nation. There is some justification to the Chinese argument that democracy is simply too new and too untested to be used as a serious form of governance. Chinese mandarins would argue that virtue or lack of virtue flow only from the top down. They would argue that there is no evidence that virtue can ever flow from the bottom up. We have seen lack of virtue flow from the bottom up when certain districts keep re-electing the same known crooks to congress. The Chinese would argue that voters elect people who are no better than they are, and you can't run a country with leaders who are that lousy. On the other hand, it's hard to avoid certain bedrock truths. It's obvious that capitalism works better economically than communism. This doesn't matter if your peasants can't find out that there is a better way than whatever economic system you're imposing, but cutting off the outside world as North Korea has done keeps you technologically backward throughout most of your economy. Although a few leaders can life in luxury, you can't afford basic necessities such as a competent blue-water navy. As the masses of Chinese and Cubans became more and more aware of just how unnecessarily poor they were, management had to do something. The only measure available to make the people better off economically was a stiff dose of capitalism. so they did that to save their hides. In our case, the peasants aren't mad enough to elect third party candidates who'll tear down our whole corrupt system. It's still unclear whether virtue can flow bottom-up. 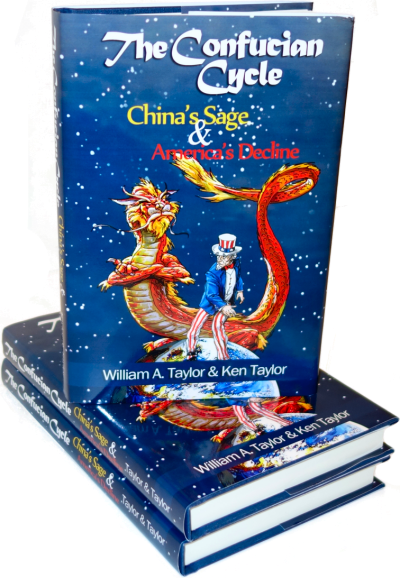 None of our current politicians or bureaucrats are willing to give up their expensive perks, so we may have to crash into the abyss of the Confucian Cycle. "What's stunning today is that they put a date and they put a number on it -- 500,000. It's a very substantial decision. It's a major shift towards a larger private sector in a Socialist economy." - PHILIP PETERS, who follows Cuba for the Lexington Institute, on the Cuban government's plan to lay off half a million workers. The government is making a massive reduction in the public sector in favor of the private sector. Good idea! Could it catch on here? Over the past several months, President Raúl Castro has given stern warnings that Cuba's economy needs a radical overhaul, beginning with its workers. With as many as one million excess employees on the state payroll, Mr. Castro has said, the government is supporting a bloated bureaucracy that has sapped motivation and long sheltered a huge swath of the nation's workers. "We have to erase forever the notion that Cuba is the only country in the world where one can live without working," he told the National Assembly last month. Since permanently taking over from his brother Fidel two years ago, Mr. Castro has often pledged to make Cuba's centralized, Soviet-style economy more efficient and open up opportunities for people. The government has handed tens of thousands of acres of state-held farmland to private farmers and begun freeing up a market for agricultural supplies. It has loosened restrictions on cellphones and other electronics, and created a few areas for private business, allowing barbers' shops to become cooperatives and giving more licenses to private taxi drivers. But these initial reforms have been comparatively limited, many analysts contend, and Cuba's economy - grappling with the fallout from the global financial crisis and the aftermath of devastating hurricanes in 2008 - appears to be in dire shape. Tourism revenues have flagged, the country has faced rice shortages and its sugar crop has been disastrous. Last year, as the government tried to hold onto desperately needed hard currency, imports fell by 37 percent. In its statement Monday, the Cuban Workers' Central, the country's only recognized labor federation, openly acknowledged the nation's troubled economy, saying that changes were "necessary and could not be delayed." "Cuba faces the urgency to advance economically," the statement said. "Our state cannot and should not continue supporting companies" and other state entities, "with inflated payrolls, losses that damage the economy, which are counterproductive, generate bad habits and deform the workers' conduct," the labor federation added. To that end, the government has previously said that it would grant new licenses to entrepreneurs, vastly expanding the kinds of businesses that can be run privately. But the announcement on Monday - saying that the layoffs would be completed by next March - suggested that Mr. Castro now intended to move ahead vigorously. "What's stunning today is that they put a date and they put a number on it - 500,000," said Philip Peters, who follows Cuba for the Lexington Institute. "It's a very substantial decision," he added. "It's a major shift towards a larger private sector in a socialist economy." New openings in the private sector would be welcomed by many Cubans, who are weary of the island's stagnation and desperate for new opportunities. Even so, the disappearance of hundreds of thousands of jobs - and with them the security of a salary, workplace meals and the chance to make extra money through tips in some cases - would come as a shock. While Cubans have access to free health care, education and subsidized food and housing, the government has already cut some of the subsidies that many Cubans rely on to supplement their average monthly wage of about $20. And given the government's record of introducing new areas for enterprise only haltingly, it is unclear that new jobs can be created as quickly as the public sector positions will be cut. "They are in the process of massively reducing the size and participation of the state in Cuban life," said Julia E. Sweig, a Cuba expert at the Council on Foreign Relations who was in Havana a couple of weeks ago. "There is a belief that there is so much pent-up demand on the one hand and so much skill on the other that the private sector will absorb them pretty rapidly." Ms. Sweig said that it appeared the government was preparing to open up a vast range of activities, including light manufacturing like furniture making and garment production. Cuba's underground economy already provides a broad array of products, she said, but under the new arrangement the government would begin to tax those new businesses. To absorb all those workers who will be laid off, the federation said that hundreds of thousands were expected to move into some form of private enterprise over the next few years. Just how strongly the government plans to hold onto its traditional economic philosophies are a matter of debate. In an interview published online by the Atlantic last week, Fidel Castro said that the Cuban model no longer worked. But in a speech at the University of Havana shortly after his remarks were published, he said that he had been misinterpreted and that what he meant was that capitalism did not work. Ms. Sweig, who was present for the first interview, said that Mr. Castro's speech correcting himself was not backtracking. Instead, she said his words were most likely intended to reassure Cubans that he did not intend to import American-style capitalism. "It is a hybrid that is evolving," she said. Still, John Kavulich, a senior adviser for the U.S.-Cuba Trade and Economic Council, warned that it would be difficult for Cuba to follow through on the full scale of its announcement. On a practical level, he asked, would the government be able to import all the tools the new entrepreneurs or small manufacturing cooperatives will need? There is also a larger question that goes to the heart of Cuba's ideology, Mr. Kavulich said. "The Cuban government is going to allow and by definition encourage people to go into private sector opportunities," he said. "What happens when some people get rich?" "The government is going to have to determine whether it will allow and embrace success, not just opportunity," he said. The WSJ got to the heart of the matter. When Cuba opened up to private businesses in the early 1990's, thousands of businesses opened including many tourist-oriented restaurants. Restrictions got so tight in recent years that many restaurants closed. There is a cost to all regulation. It will be interesting to see if the Cubans understand the "get out of the way" part of the Chinese plan or only the "squeeze the state" part. It would help America of the Obama administration understood either of them. Rigid ideologists have long known how to make tactical maneuvers to further their ultimate goals. The most famous case was Vladimir Lenin in the 1920s. While the Communists had won the civil war, the Soviet Union's economy was moribund, threatening the Red regime's survival. Entrepreneurs did not fear taxes and regulations; they feared for their very lives. Lenin know the economic paralysis had to be broken. With great fanfare, he introduced the New Economic Policy. Small, privately held businesses would be permitted and they would be allowed to pocket their profits. Peasants could keep and till their land. This liberalizing had the desired effect of bringing the Soviet economy back to life--allowing Lenin and his confederates to consolidate their power. Once that was achieved, the New Economic Policy was murderously reversed. That's exactly what Castro did earlier in Cuba - he permitted businesses when he had to, and then clamped down. What makes anyone think that this time will be different? Letting Cubans have small businesses will fix the economy, to be sure, but what then? The Times points out rightly that the Chinese got to the first level of economic success by offering economic liberty without political liberty. This is what Cuba is trying to do. Can they go to the next level without political freedom? its people to have only economic liberty? Place your bets. There has been a lot of buzz lately about investors "shorting" China's overheated real estate market, basically betting that it will go down. I say that's peanuts. There is a much more interesting shorting opportunity in China today. It is truly "The Big Short," and that is betting that China can't continue to grow at this pace indefinitely by only permitting its people to have economic liberty without political liberty. I'm sure Goldman Sachs would write you a credit default swap on that, and the Chinese Communist Party would take the other side. Are you game? It seems that the Nobel Prize Committee is. I'd be, too. The Norwegian committee just awarded its 2010 Nobel Peace Prize to Liu Xiaobo, the jailed Chinese pro-democracy activist. The message to Beijing, I'd argue, was simple: Liberty is a value in and of itself, because without it human beings can never develop their full potential. And, therefore, liberty is also an essential ingredient for any society that wants to thrive in the 21st century. Otherwise, it can't develop its full potential. China has thrived since Deng Xiaoping by offering its people economic freedom without political freedom. And surely one of the most intriguing political science questions in the world today is: Can China continue to prosper, while censoring the Internet, controlling its news media and insisting on a monopoly of political power by the Chinese Communist Party? I don't think so. To be sure, China has thrived up to now - impressively - by permitting its people only economic liberty. This may have been the sole way to quickly take a vast country of 1.3 billion people from massive poverty to much-improved standards of living, basic education for all, modernized infrastructure and even riches for some urbanites. My reason for believing China will have to open up sooner than its leadership thinks has to do with its basic challenge: It has to get rich before it gets old. Because of its one-child population-control policy China, over the next few decades, will go from a country where two sets of grandparents and one set of parents are all saving for the computer for one kid, to a country where one kid will be supporting the retirement of two parents and maybe one grandparent - with little government help. Moreover, because of the practice in some families of aborting female fetuses, there could be 20 million to 40 million more men than women in China in the next few decades, and that will force some men to go abroad to find brides. I am concerned as much of the world that has struggled with the relationship of sustained economic development and personal freedom. Obviously expansion of personal freedom drives economic development. These many developing economies are wising up and starting to move in the right direction.Seeing the positive attributes of freedom upon economic development. My concern is: Why are we willing to give up our freedoms to the strangle hold of an unserviceable national debt? Why do those who denounce the evils of capitalism " elitist left & radical Muslim"have such a powerful voice at this point in history? Why do we allow the negative voice of these 2 minority voices convince us that personal freedom and prosperity are evil. God tells us over and over to go forth with HIM in the middle of our lives and model the example set by HIS Son and to prosper. Could it be that our biggest problem is a faith & moral issue? We confess as a majority to be Christian but most of our actions at best are luke-warm. God tells us He will spit out a luke-warm faith. Cuba is still as mysterious as ever. Not long ago, there were smart people who doubted that such a thing as a post-Fidel Cuba could even exist. What comes after the Castros is as much of a mystery as ever.